Another weekend, another two wins for the Chicago men’s basketball team. The No. 11 squad dispatched the No. 17 NYU Violets on Friday and the Brandeis University Judges on Sunday, with both victories coming in front of some of the largest crowds of the year. The Maroons, now having won 13 games in a row, improve to 5–0 in conference play. Friday night was Hoops at Hogwarts, at which a packed house of students received Harry Potter–themed T-shirts and watched a Quidditch match during halftime. However, the main attraction was the game itself, as the Chicago squad faced its biggest challenge of the season so far: the Violets of NYU. The Maroons jumped out to an early lead and were ahead 21–6 early in the first half. 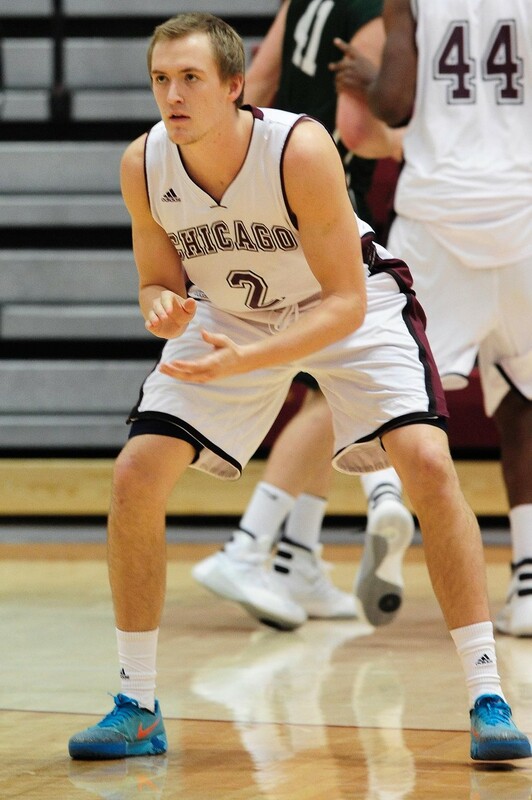 Strong showings from fourth-year forward Jordan Smith, who netted 15 points, and third-year forward Waller Perez with 14 points, helped the South Siders maintain their lead the entire game, with the final score tallying 69–58 in Chicago’s favor. Coming off their Hoops at Hogwarts high, the Maroons faced off against Brandeis on Sunday afternoon. However, the squad came out sluggish. Both teams missed easy shots and struggled to string passes together. Each team shot below 40 percent from the field in the first half, and the Maroons were lucky to exit the period with a 24–22 lead. Yet when the Maroons emerged for the second half, they looked nothing like the group that couldn’t find the bottom of the bucket earlier in the game. They managed over 50 percent from field, including five three-pointers, and pulled away from Brandeis fast, winning handily by a score of 65–50. The victories this weekend were defining moments in a season that is shaping up to be special for the Maroons. The squad is forming an identity by defeating a ranked conference opponent and emerging victorious in a game where the team wasn’t at its best. However, the players aren’t letting themselves get distracted by what their accomplishments might mean for the school. “We proved that when we play together and are focused we can compete with anybody. We have an enormous weekend against Emory and Rochester coming up to prove that we can stay consistent,” he said. With Emory and Rochester representing their biggest conference challenges besides the Violets, the road won’t be getting easier for the Maroons anytime soon. The Maroons face off against Emory at Ratner Athletic Center on Friday, January 29. Tip-off is scheduled for 8 p.m.